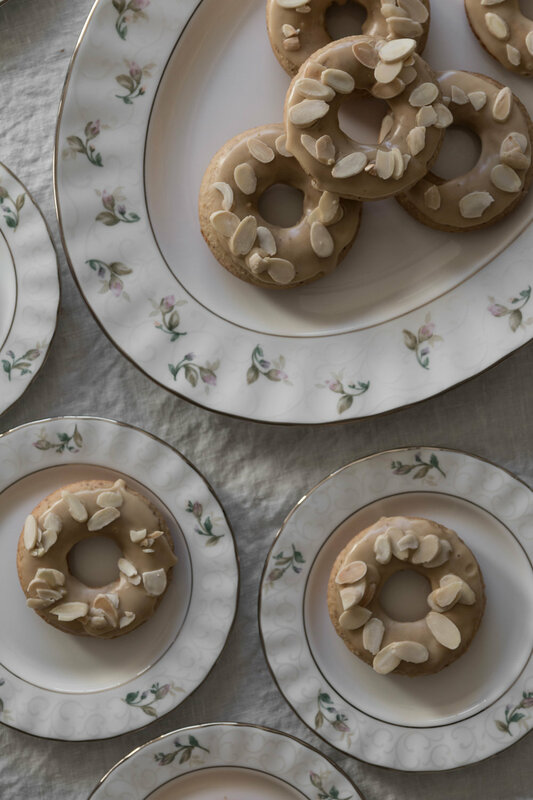 These maple donuts are made of fluffy pastry flour and buttery almond flour held together with maple syrup and almond milk, among other things, to really bring home this almond and maple flavor combination. This is a healthful, baked version of a commonly fried treat sporting a slathering of maple glaze and crunchy almonds on top. Serve a plateful of these as a sweet treat for a weekend brunch or whenever your next donut craving hits. *For a non-vegan version, you can swap the ground flaxseed and water mixture for 1 egg and the almond milk for cow’s milk. *Equal parts cornstarch and powdered sugar helps thicken this maple glaze without making it too sweet to account for the sweetness of the maple syrup, however, you can use just powdered sugar if you like. Preheat the oven to 375 degrees and grease two 6 count donut pans. Mix the ground flaxseed and the water in a small bowl and allow to thicken for a few minutes. Combine the almond milk with the thickened flaxseed mixture and vanilla. Add the salt, baking powder, baking soda, and apple cider vinegar and mix until combined. Fold in the almond flour and pastry flour until it’s just combined. Spoon the batter into a pastry bag or a ziplock bag if you don’t have one (if using a ziplock bag, snip off a corner of the bag once it’s filled). Pipe the batter into the greased donut pans. Bake the donuts for 25 minutes and allow to cool a bit before removing from the pans with the help of a butter knife. Allow to cool completely before adding the glaze. To make the glaze, begin with 1/2 cup maple syrup and equal parts cornstarch and powdered sugar, starting with 2 tablespoons of each. Whisk until combined, adding more syrup if you prefer a thinner consistency or more equal parts cornstarch to powdered sugar for a thicker consistency. Double these amounts if you desire more glaze. Dip the top of the donuts into the glaze mixture, then set on a wire cooling rack and immediately sprinkle with the shaved almonds. The glaze will set in a minute or two. These can be served immediately or made the night before and stored in the refrigerator for the next day. Bring to room temperature before serving. 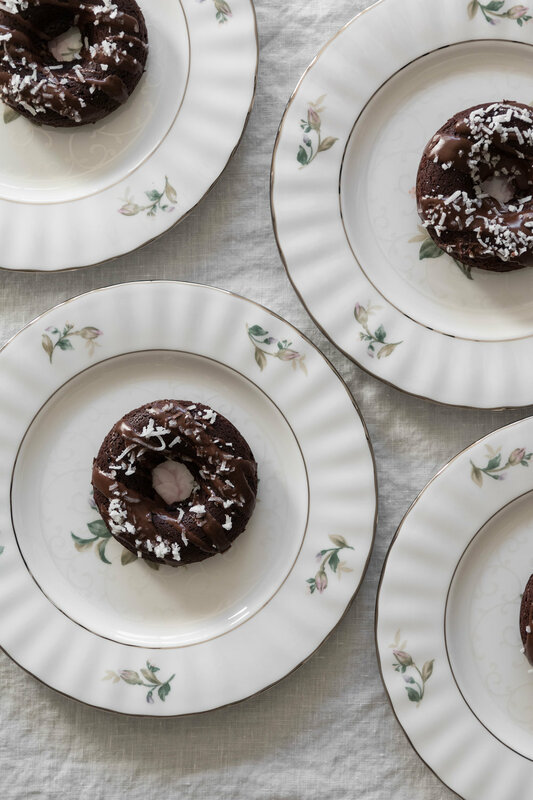 These brownie-like cakes baked in a donut mold offer a lighter version of the fried stuff, batter whisked with coconut oil and coconut milk along with all the chocolate to create a rich and tropical flavor combination. Those following a vegan diet or with food intolerances will be happy to know these treats are completely egg and dairy free. Drizzle them with a bit of melted chocolate and shower with a handful of dried coconut flakes after they’ve cooled, if you like. I think they’re lovely served with hot coffee on a special Saturday. Mix the ground flaxseed and the water in a small bowl and allow to thicken for a few minutes. During that time, melt the coconut oil and chocolate chips together in a microwave or double boiler, whisking until combined. Pour into a mixing bowl and add the coconut milk, the thickened flaxseed mixture, and vanilla. Add the salt, baking powder, baking soda, and apple cider vinegar and mix until combined. Fold in the flour and cocoa. Spoon the batter into a pastry bag or a ziplock bag if you don’t have one - if using a ziplock bag, snip off a corner of the bag once it’s filled. Pipe the batter into the greased donut pans. Bake the donuts for 25 minutes and allow to cool a bit before removing from the pans. Once they've been removed and have cooled completely, Drizzle with a bit of melted chocolate and top with some coconut flakes. Serve immediately, or bake the night before and store in the refrigerator for the next morning. Bring to room temperature before serving. Lemony sweets weren’t something I found myself craving often until a dear friend introduced me to her mother’s lemon bar recipe. After tasting that delicious dessert a few years back, was hooked on the combination of yellow citrus and sweet confections and it’s led me to experiment with featuring it in different forms of baked goods. This yogurt cake combines bright lemons with the flavor of thyme, lightly sweet and just lovely for an afternoon treat. Though this is a cake at its core, no frosting is required - just dust the top with a bit of powdered sugar and help yourself to an unfussy slice or two. Serve with a splash of black coffee or herbal tea. Juice and zest of one lemon, about 1/4 cup juice and 2 teaspoons zest. *This amount makes this cake mildly sweet, lovely for a brunch or afternoon cake. For something slightly sweeter, you may increase the sugar by adding an additional 1/4 cup. Combine the flour, baking powder, and salt and stir until thoroughly mixed. In a separate bowl, whisk the yogurt, lemon zest, sugar, eggs, and oil. Slowly whisk in the dry ingredients. Pour the batter into a buttered and parchment lined 8 1/2 by 4 1/4 by 2 1/2-inch loaf pan and bake for an hour to an hour and 15 minutes. Brush the top of the loaf with some of the lemon juice while hot. Allow the loaf to fully cool, then top with powdered sugar and any garnishes. It’s that time of year again. Pumpkin as a flavor is being celebrated and used in the most creative ways; from pasta sauce to salsa to cookies to muffins, it makes even the most unconventional recipe resemble a bit of an autumnal flavor profile. Pumpkin pie is probably one of the most traditional ways to use pumpkin, and it’s always a favorite of mine to whip up at least a couple times when the weather starts to cool. Every thanksgiving I make it a point to make one for the table, and this year I wanted to give it a bit of a twist. 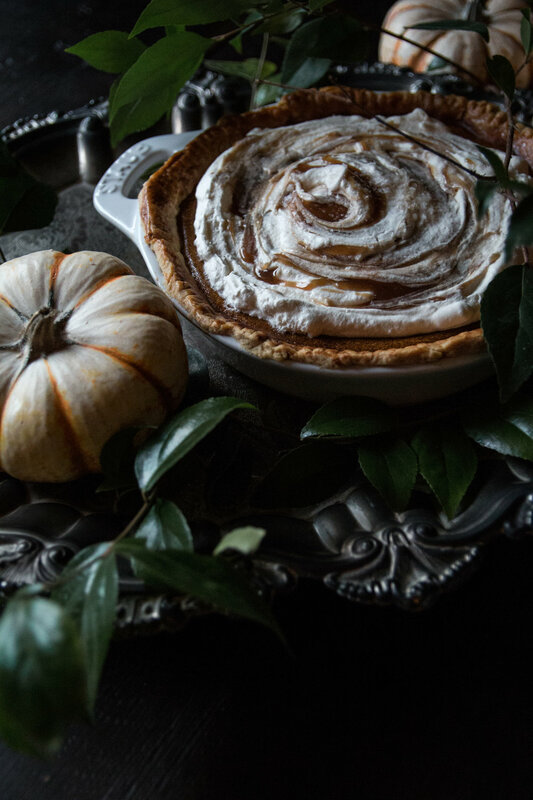 This salted butterscotch pumpkin pie is just the thing to help spruce up Thanksgiving dessert with a little extra flair, keeping true to traditional pumpkin flavors but adding a depth of flavor from homemade butterscotch, made with a bit of extra salt to boot. The sauce is surprisingly easy to make, and although it’s an extra step in the pie making process, it adds a rich caramelization to the filling that sets this recipe apart. It’s nothing bold, but enough of a difference in flavor to make your guests wonder just what it is that makes that pie taste particularly wonderful. In the recipe, I recommend setting aside a little portion of the butterscotch out of the filling for drizzling on top and swirling with lightly sweetened whipped cream. You may add a pinch or two of flakey salt to it at the end, if you want to emphasize the salted butterscotch flavor. Preheat the oven to 375 degrees. To make the pie dough, mix the flour, sugar, and salt in a food processor, pulsing until combined. Add the butter, pulsing just until there are small bits of butter throughout, resembling sand. Add the water, a tablespoon at a time, until the dough just begins to come together. Wrap in plastic wrap and tuck away in the fridge to chill. While the dough chills and the oven is heating, make the butterscotch. In a saucepan over medium heat, melt the butter and add the brown sugar, stirring until the butter is melted and the sugar has dissolved. Add the cream and allow the sauce to bubble, not stirring for 2 minutes. Add the rest of the cream, salt, and vanilla, whisking until fully incorporated. Allow the sauce to thicken over low heat for 2 minutes. Set aside to cool. Reserve 1/4 cup separately to drizzle over the finished pie. Take the dough out of the refrigerator and on a floured surface, roll out the dough. Transfer it to a 9 inch baking dish, trimming the edges and adding crimps or using a fork to press lines into the crust. Prick the bottom of the dish a few times with a fork. Cover the dough with parchment paper and pie weights (or uncooked beans) and place in the oven. Bake for 30 minutes, remove the parchment and pie weights, then bake another 5. Remove the baked pie crust from the oven and allow to cool while you assemble the filling. To make the pie filling, whisk together all of the cooled butterscotch (omitting the 1/4 cup reserved for drizzling), the pumpkin purée, the milk, and the eggs. Add the flour, pumpkin pie spice, and salt. Pour into the baked crust (you will have a bit of extra filling left over), brush the egg wash onto the crust, and bake for 50 to 60 minutes, until the filling is set. Cover the crust with aluminum foil if it browns too quickly. Allow to cool completely before serving, topping with some whipped cream and the reserved butterscotch, along with a little pinch of Maldon salt if you wish.